Come and enjoy an evening of wine, music and talk with the founders of Duende Natural as they share their works on creating an intentional communal village on the Caribbean coast of Costa Rica as well as here in the states using environmentally sound models with permaculture and eco-friendly designs at its base. 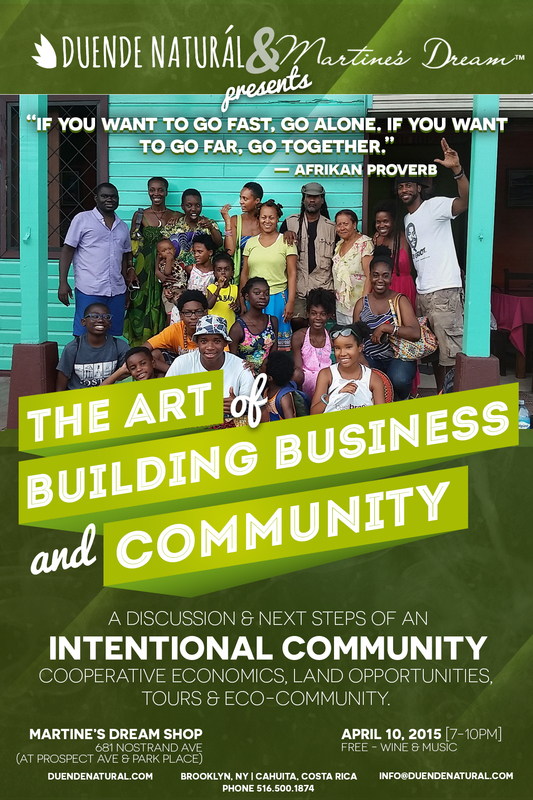 • How to purchase with an intentional community and more! 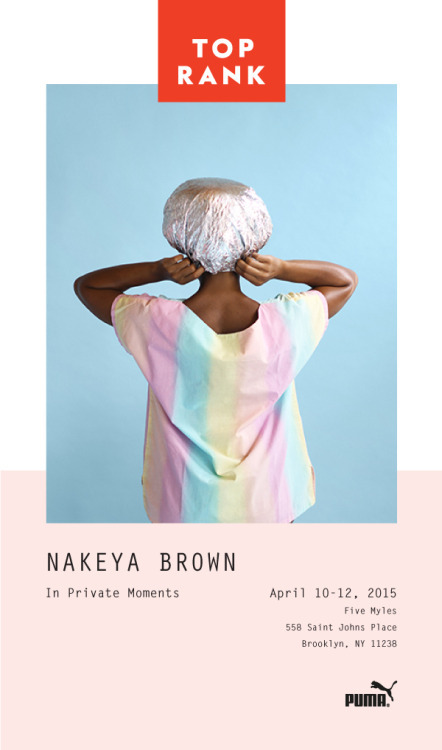 TOP RANK Magazine and FiveMyles is pleased to present In Private Moments, an exhibition featuring the photography of Nakeya Brown. Brown’s whimsically colored, minimally composed still-lives examine the visualization of black womanhood by engaging with the fraught cultural politics of hair. With a conceptual focus on the objects and rituals of hair maintenance, Brown’s portraits present the duality of emotions associated with black hair aesthetics – happiness and pain; beauty and sacrifice; collectivity and alienation – to render visible the deeply intimate process of self-representation. Brown’s photography is featured in the inaugural issue of TOP RANK Magazine. Friday, April 10, 9:00pm till you say when! dj chibuikem & dj quesquecest bringing you soca & reggae & funk & soul & hip-hop & house & afrobeat & naija & classics & everything in between! Good tunes, good times, good folks. Soul, funk, reggae, Afrobeat, classics, 90’s hip hop, house – From Al Green to Fela to Magic System to Machel Montano to A Tribe Called Quest to Wu-Tang! Join us this Saturday for our first Trunk Show of 2015 featuring TAARIK, an ethical and sustainable fashion brand by local designer Betty Teshome. Her Ethiopian + Indian collections of artisan-made scarves and launch her new line of Ethiopian leather handbags. Every garment comes with a story, and proceeds help fund education for girls around the globe. Complimentary refreshments provided. Clean out the closets and get ready for warmer weather as we celebrate spring with family-friendly live music, film screenings, dance classes and more. Followed by an evening dance party by I Love Vinyl, their approach is mind-wide, foot-friendly and snap, crackly, poppin’; meaning that genre, time period and recognizability take a back seat to quality, taste and skill. Disco, house, soul, boogie, jazz/funk, hip hop, techno, no wave, new jack swing, Latin, electro and Afrobeat are woven into a cohesive, funky and irresistibly danceable sonic manifesto. Laptop-free since 2009. THIS SAT: Brooklyn’s Best All-Ages, All-Day Party!